Doing custom framing for artists and photographers to achieve a superior presentation for their art is one of the most rewarding activities I can think of. To work with a photographer and to come up with a unique presentation which honors the intention of the original photograph is a challenge which offers many rewards. This photo by Jeri Rogers could have been framed in a dozen different ways, but this frame and mat created an unforgettable impression that seemed right for the particular purpose. You can visit Jeri’s website to see more of her fine work. Whether art is produced by a professional or by a child, it can be given a unique and memorable presentation by respecting the intention that went into creating the artwork. I find that there always seems to be a way to achieve the results intended if I keep looking for affordable alternatives if our first choices exceed the budget available. There is as much satisfaction in achieving an affordable result as there is in spending top dollar to get a specific result. Believe it or not, well designed framing solutions can produce a "wow" reaction with a wide range of mouldings and mats. When the final result is also affordable, it makes everyone happy. 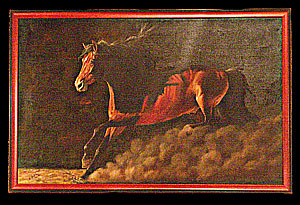 This horse painting in Valentin Soto’s El Charro restaurant in downtown Floyd adds the right touch of elegance to this popular dining spot. The painting came to me as a loose piece of canvas rolled up in paper. Valentin had a vision of what he wanted and I was able to produce the result that you see here. Now you can admire Valentin’s horse while you enjoy the tasty food at El Charro. Like almost every other kind of design activity, affordable results encourage continuing customer interest. That is a direction worth following, especially in Floyd County, Virginia where you will find me working in my shop almost every day of the week. This entry was posted in Doing What You Love and tagged affordable custom framing, custom picture framing, Floyd Custom Framing, Floyd Virginia, Jeri Rogers, jeri rogers photography. Bookmark the permalink. I am a regular visitor to this “shop” and witness the transformation of art that arrives in a mailing tube come alive. It’s something to behold. Both of these pictures are gorgeous. 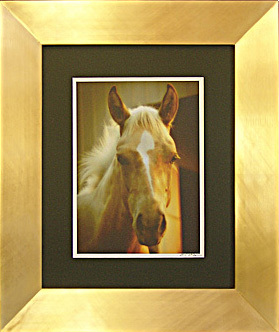 I actually thought the framing on the Jeri Rogers pic was a computer added effect – looks like a halo surrounding the horse on the computer (and no my screen isn’t fuzzy 😉 I’d like to see this in person!